A big chunk of what makes me the person that I am is that I eventually learned about the ins and outs of record collecting, though it was an arduous trek on my on in the wilderness with no other hands to guide me. When I discovered import singles, I became aware that [especially in the UK] there were lots of songs that got recorded by artists that I liked that never made their way onto the actual albums. The lure of non-LP B-sides eventually grew to eclipse my fervor for albums as the primary focus of my attention. After all, singles were ephemeral. They got released and then got harder to find over time, unlike their associated albums, which could remain in print indefinitely. It’s past time to give some attention to the songs that were released almost as an afterthought for connoisseurs of fandom to discover like the gifts that they were. 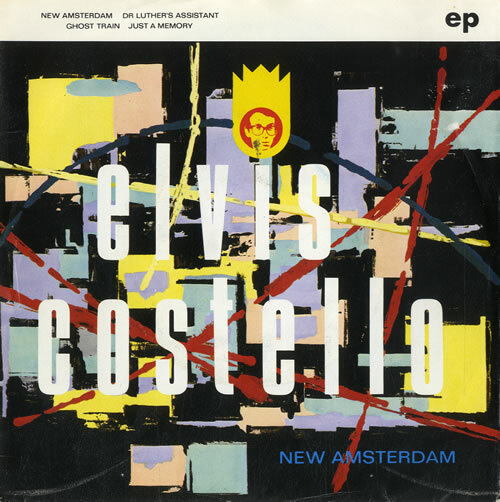 “New Amsterdam” was the third single to be released from Elvis Costello + The Attractions’ song-packed album “Get Happy!” in 1980. This single was available in two different configurations. A normal two track 7″ [which retained for 50 pence – the price was printed onto the sleeve] and a four track full EP. We won’t mention the four track picture disc all the better to influence the charts with. Savvy consumers should have bought the full EP version. Cheaper fans would have missed out on what is my personal favorite Elvis Costello song ever; the heart-wrenching ballad “Just A Memory.” The spartan track contains just Costello, his vocals double tracked to pad out the arrangement, and the sturdy Steve Nieve on piano [with a smattering of organ]. There are no rhythm instruments or guitar to intrude here. The song was written for Dusty Springfield to sing, and with the addition of a third verse, she eventually did. I’ve never heard the Springfield cover of this song, but I can’t imagine it being any more potent a song in even her capable hands. The bittersweet, late night intimacy of the song’s delivery packs a wallop far more devastating than its 2:15 length would indicate on the face of it. One listen to this number and the thought “now this is songwriting” comes to mind. There is nothing to hide behind here. The melodramatic piano is downplayed from Nieve’s often busy hands with a severe economy that I don’t usually associate with his often ornate playing. It’s all about Costello here, and the one bet he hedged was in double tracking his vocals on the chorus. I sometimes think that his decision to do that gave even this fine song a hint of compromise. The later recording of this on the Costello + Nieve boxed set as recorded live on their magnificent Lonely World Tour in 1996 strips it down to its essence, though Costello sang the longer Dusty Springfield arrangement of the tune instead of the brief, but even more memorable 1980 EP version. This original version is a succinct emotional haiku in comparison. Its power is in inverse proportion to the amount of energy expended in its performance. This entry was posted in Core Collection, The Great B-Sides and tagged 1980, Elvis Costello, EP, Just A Memory, New Amsterdam, The Great B-Sides. Bookmark the permalink. Please, sir, could we have some more Elvis Costello posts? I’m a big Madness fan and my entry into the world of EC single rarities was his duet with them on “Tomorrow’s Just Another Day,” one of my favorite Madness tunes. Tim – Yes, it has been some time since EC has figured here. Not since the Spectacular Spinning Songbook hit town, but wow, that was a fantastic show! My favorite 7″ EP of all time. Each track is equal to the next for me. I know the lyrics to each of these tracks by heart to this day – that’s how often I used to listen to it. As for the DS version of Just A Memory. It ended up on a Nicky Hopkins album with Dusty providing vocals, and it is fully orchestrated for a band with guitars, bass and drums. This assists Dusty in giving her vocals a bit more power, but the interpretation is a bit to slick for my liking. The extra verse is definitely unnecessary. Ghost Train is one of the first songs I believe Costello ever wrote and is about his father playing working men’s clubs around England in the 60’s. I remember him telling the story on one of his tours in the 90’s. That whole EP is a sweet slice of pie, but yes “Just a Memory” has stayed lodged in mine since the first time I heard it. This and “Hoover Factory” are both brilliant little toss-offs, but this one has ALL the emotional wallop. Driving home from work today there was nothing good on NPR or Wisconsin Public Radio so I tried one of the radio presets that my wife has on the car radio. I caught a song that I luckily have eluded hearing all my life, something by the Escape Club called Wild Wild West. Does Costello get royalties off of this? When the station tuned I was like, cool, Pump it Up! And then I had the Uncomplicated realization………it was not Pump it Up on my Radio Radio. It’s a sad dark day indeed when the best thing that I hear on the radio driving home was Huey Lewis and the News. Tim – WOW!! You’ve NEVER HEARD “Wild Wild West” by The Escape Club?! I was still seeing MTV in 1988 and that creepy video was in maximum rotation. That thing was inescapable! I just looked it up and saw that it was number ONE on the Billboard charts. Yeech! I never knew that but could not abide the song. The completely smarmy vocal delivery for one thing so annoyed me that I never twigged to the “Pump It Up” rips until you just mentioned them! Holy…! For me the killing stroke was the fake Jamaican accented toaster in the middle eight! Stuff like that is just like a knife in the gut! Amazing factoid: The Escape Club were distantly related to The Expressos. The bass player came from that New Wave band whose album I always used to see in the bins… or was that The Sinceros? The most telling factoid of all was how it is the only song by a British group to reach number one in America while never ever charting in the UK. Way beyond what The Fixx, Wang Chung, or AFOS ever experienced. The best thing to come out of Huey Lewis is a sendup that he and Weird Al Yankovic do of American Psycho.